I have heard a lot about Designing Disney's Theme Parks: The Architecture of Reassurance edited by Karal Ann Marling over the years. Honestly, I've often understood it to be next to John Hench's Designing Disney as a classic of the field. So when I found a used copy of Designing Disney's Theme Parks I knew it had to find it a spot in the Between Library. Designing Disney's Theme Parks: The Architecture of Reassurance edited by Karal Ann Marling serves as a companion to an exhibition at the Canadian Centre for Architecture in the 1990s. As such, the book is focused heavy on design. The text includes articles on Imagineers as artists by Marty Sklar, design, Disneyland and culture and setting. The essays are surrounded by the many images including design sketches, model pictures and images of the park in action. Overall the general theme stresses the importance of understanding design in Disney Theme Parks and learning from them in other projects. Honestly, I do not believe that Designing Disney's Theme Parks will be a go to book for me. The book does a good job of discussing design. But a lot has changed since the 1990s. The images includes many that at publication date would have likely been new to the reader, but today they have been published in numerous other books. But the difference between this volume and more recent is accessibility. This text really speaks to designers, and converses to them as professionals. Other offerings have a more general audience, speaking to many different fields. Additionally, I had hoped that a major theme of Designing Disney's Theme Parks would be movement. Honestly this is touched on but not empathized to the level I had expected from other commentators. Perhaps that fact this is a collection hindered the ability for it to maintain the consistent theme. 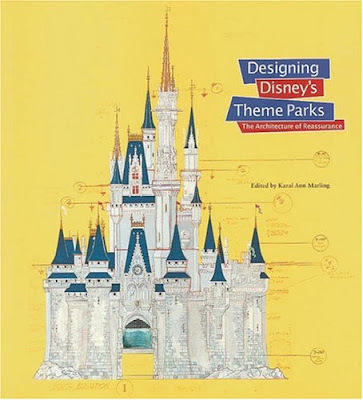 Designing Disney's Theme Parks: The Architecture of Reassurance edited by Karal Ann Marling is an important Between Book. It served as a predecessor for many of the design books that we have now, using pictures to help tell the Disney story. Hard-core Disney history fans need this volume. However, more casual readers may want to seek out a less technical book.